Why Children Should Read: 20 Inspirational Quotes and Insights #infographic ~ Visualistan '+g+"
Today’s children are tomorrow’s leaders, and that’s why nothing is more important than our children’s education. Particularly, literacy is at the top of the list of priorities. Children who read often are able to relate to experiences outside of their own, as well as to develop empathy, creativity, and comprehension skills. Promoting literacy and reading has been on the minds of some of the most well-respected individuals in history. These include world leaders, intellectuals, authors, celebrities, and business people. This infographic from AAA State of Play compiles quotes from well-known public figures, with the goal of inspiring young people to read. You’ll find quotes from Albert Einstein, Walt Disney, President Barack Obama, Maya Angelou, J.K. Rowling, and many others. Parents and teachers will be inspired to share a book with a young person, and to show youngsters that reading is not only essential, but also fun! 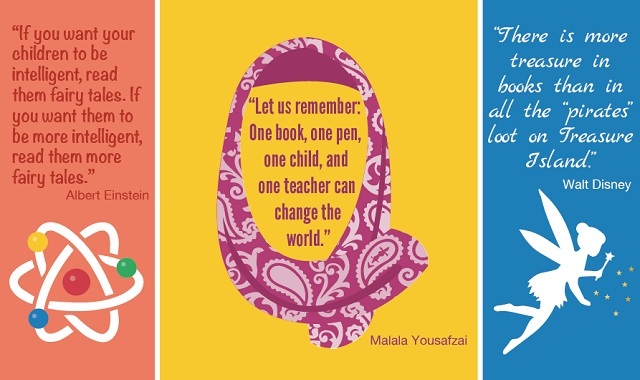 How has the power of literacy impacted your world?